The future 3 Series looks fun to drive, but it doesn't look much different. BMW’s engineers aren’t afraid to toss around a test mule in the snow, and in this spy video we see a few instances of them sliding in the new 3 Series. Our spies believe this this prototype wears all of the production body panels, so this general shape is a good indicator of what to expect when the sedan arrives in dealers. If this is really the camouflaged version of the final design, then it looks like the new 3 Series, reportedly called the G20, takes major cues from the latest 5 Series, which in turn looks quite a bit like the current 7 Series. The biggest styling tweak up front is that the grille and headlights appear to be shorter vertically, which gives the face a squinty, more aerodynamic appearance. There look to be similar changes to the taillights, too. 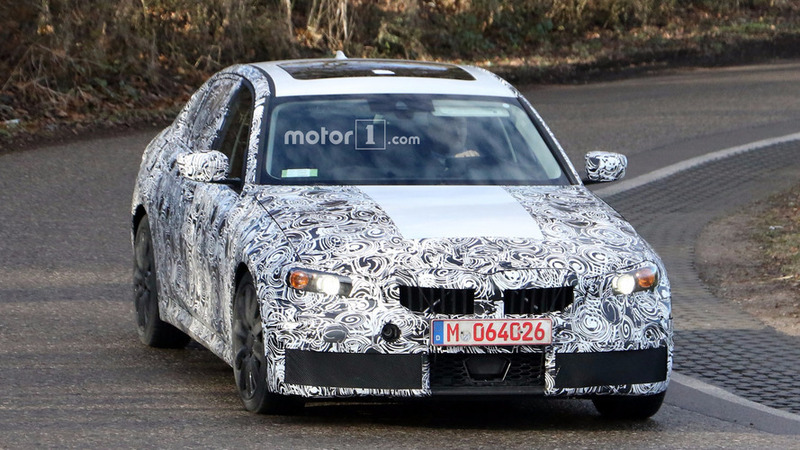 Earlier spy photos show a 3 Series with M Sport upgrades under development. The body features larger openings in the front fascia, trunk lip spoiler, and more stylish exhaust tips at each corner. A stiffer suspension and better brakes are also probably part of the package. While hard to notice without context, the move to the CLAR platform should allow for a longer wheelbase, which would mean more room inside, and slight increase in overall length. Despite the larger size, the chassis also should cut weight – reportedly as much as 176 pounds (80 kilograms). Under the hood, expect many of tunes of three-, four-, and six-cylinder engines in gasoline- and diesel-fueled varieties. A plug-in hybrid is also on the way, and there are rumors that a fully electric model could join the lineup later. The G20 3 Series may debut in the second half of 2017 – possibly at the Frankfurt Motor Show in September. If the sedan premieres there, it could be available in some markets before the end of 2017. From then, you can expect a variety of body styles and variants like the M3 to slowly arrive.